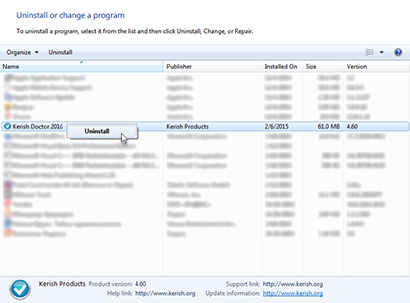 How to uninstall Kerish Doctor 2019? Kerish Doctor 2019 can be removed in the same way as any other program in Windows. Follow the instructions below to remove the program from your computer. 1. Click "Start" → "Control Panel". 2. Select "Add or Remove Programs". 3. Double-click on "Kerish Doctor 2019" in the list. 4. Click "Yes" in the dialog box asking you to confirm whether you want to remove the software. Where is the Control Panel in Windows 8 (8.1)? 2. Select the "Small Icons" or "Large Icons" view option to the right of the "View by" drop-down menu. 3. Select the "Programs and Features" section. Are there still links to the application in the Recycle Bin and file context menus after deleting the application?